This package will take you by road to Samburu. Offering unique vistas rounded, rugged hills and undulating plains on you The reserve is home to lion, buffalo, giraffe, elephant and zebra as well as monkeys, warthog, waterfowl and more. Rhino are a special added attraction. Especially having a lifetime chance to move up close to Morani the resident tamed Rhino. There is also a chimpanzee sanctuary located here. Offers unique vistas of rounded, rugged hills and undulating plains. The mix of wood and grassland with river line forest and swamp home to a wide variety of animal and birdlife, Buffalo Springs records over 365 species of bird. Game viewing and visibility is excellent: Reticulated Giraffe, Grevy’s Zebra, elephant, Oryx, Somali Ostrich, hippo, crocodile, gerenuk, buffalo, lion, leopard, cheetah and hyena. Day 01: Nairobi - Samburu. Depart in the morning and drive north through the lush tea and coffee plantations of central Kenya and across the equator on the way to the northern foothills of Mount Kenya, a 17,058-foot dormant volcano with a glistening cap of ice and snow. Arrive at Samburu for Lunch. After lunch proceed for an afternoon game drive in this grassland area, which forms the bridge between Kenya’s lush south and parched north. 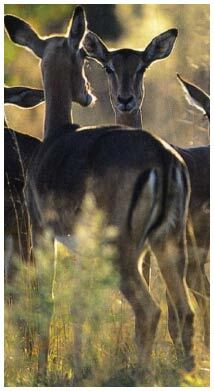 Watch out for herds of impalas, Grant’s gazelles, and African buffalo and Elephants. Dinner and overnight at Samburu Serena / Samburu Sopa / Samburu Intrepids/ Sarova Shaba. A morning and afternoon game drive which includes outings at dawn, when animals are most active and afternoon when the light is best for photography. Return to the lodge for breakfast, lunch and dinner. This day you stay close to the Ewaso Nyiro River, where vast herds of plains game come to water, braving lions in the grass, leopards in the trees, and giant crocodiles. Stars of Samburu not easily seen elsewhere are the liver-red reticulated giraffe, the long-necked gerenuk antelopes, and the elegant grevy’s zebra. All meals at the Camp / Lodge, Overnight at Samburu Serena / Samburu Sopa / Samburu Intrepids/ Sarova Shaba. Day 03: Samburu – Nairobi. Breakfast at the Lodge / Camp and then depart for Nairobi. Arriving in the Afternoon. Lunch at Carnivore / Pampa Restaurant.